In this tutorial I’ll teach you how to factory restore Android on your Acer beTouch E110. This Android reset process will erase all data that is not vital to the operation of the system of your Acer beTouch E110. This will include deleting all your messages, contacts and even installed apps. 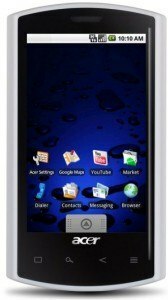 If you do not want to lose your data and you still have access to the use of Android inside the Acer beTouch E110, we recommend you to perform a backup through G Cloud. This tool saves a copy of all your device in the cloud, and can be found in the Google Play Store. You can access the settings menu from the main screen of your phone: Go to Settings > Privacy > Factory data reset > Reset phone > Erase everything , wait a few seconds and the phone will reboot in factory default mode, just as if you unboxed it brand new. If you need to reset Android in your Acer beTouch E100 because you forgot your pattern lock password, or your phone is completely berzerk (unresponsive), do not worry: There is also a way to reset this Android phone from a secret menu, without entering into it’s Android OS. After 5 seconds, you can depress the POWER button, but keep pressing the other two buttons. You will see a secret menu appear: You can release the other two buttons. Repeat the above step to confirm the option ” Yes – Delete all user data” and wait until the process completes, when you do just press the power button again to restart. 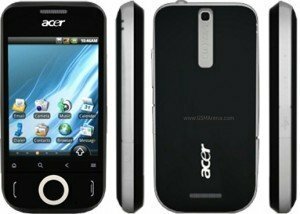 If you own an Acer Liquid E phone and you find it running slow, or even you have forgotten the blocking patter password, then you may want to reset Android and give it a second chance. That’s why today in this tutorial we will teach you two ways to restore the factory settings on your Acer Liquid E. The first way will work even if you have no access into Android OS. It is important to understand that all your contacts, messages and installed apps will be deleted from your Acer Liquid E when performing an Android reset. All customization you may have applied into your Acer Liquid E will be forgotten. If you do not want to lose everything and still got access into your phone’s Android operative system, then you should make a backup. There are tons of backup / restore apps in the Google play store. We recommend the G Cloud app. If you still can access your Android settings menu on the Acer Liquid E, you can easily invoke the oficial reset procedure: tap into Settings > Privacy > Backup and Restore > Factory data reset > Reset phone > Erase all and then wait for your Acer Liquid E to restart, restored to it’s factory default settings. Turn off the device , wait some seconds to be sure it is completely powered off. When finished, your Acer Liquid E will reboot into factory default state.